After my spark of inspiration yesterday I got to shopping and sourcing some new ways to bring a brighter color palette into the living room. I still want to work around the bigger items in the room, like my upholstered chair in a graphic mustard print, and the gray walls and Cb2 pouf I recently bought. So I decided to mix in some pinks and reds and a litttle bit of blue — fabrics have been ordered and I’m ready for a mini-makeover! A change of pace. Decorate book signing. 6 Responses to "Color inspiration." I love all the color! And love your header! Looks great. Ooh love these bright colors and patterns! 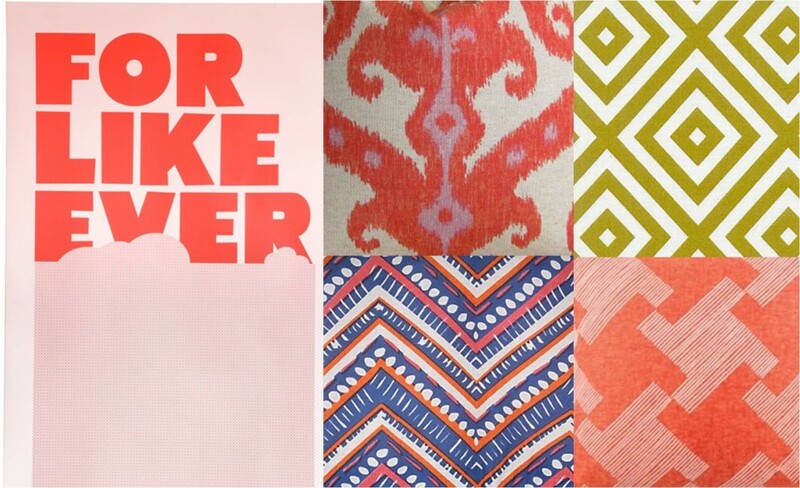 I love the ikat! I almost purchased pillows in this print from Etsy. I think I need to go back and swoop them up! I really like the green. its bright but not too bright that you will grow bored of it. I also love the ikat, great pattern. Cant wait to see pics of the makeover! Altho recently I’ve been thinking of going more boho with it, a la Amanda Peet’s daughter’s daybed!